Microsoft’s Surface Pro lineup has been a design win for the company for several years now. 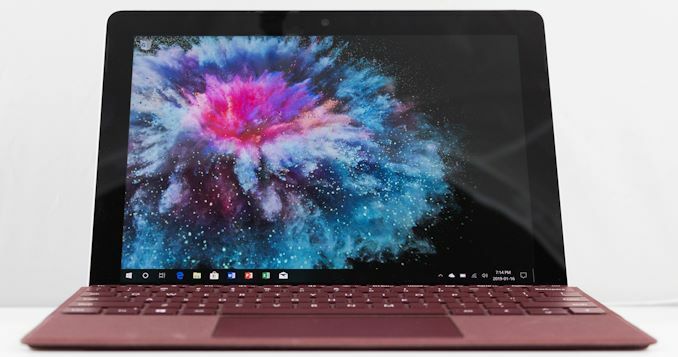 The Surface Go was launched in July of 2018 as a lower-cost version of the Surface Pro, offering buyers a less expensive way to become a Surface customer, and by the nature of its smaller size compared to the Surface Pro, an even more portable convertible Surface tablet. When the device was initially announced, a model with LTE connectivity was also in the works, and the Surface Go LTE arrived in November 2018. Featuring a 10-inch display, the Surface Go is quite a bit smaller than the Pro, and the obvious comparison to make would be against the Surface 3, which launched way back in 2015. In the three year gap between these models, Microsoft had seemed to abandon the idea of the smaller convertible tablet in their lineup. But thanks to the smaller price tag, it was always a popular model, and it is great to see them reintroduce the reduced size Surface again. Even though the Surface 3 launched way back in 2015, it still has a usage share higher than any Surface launched outside of the Pro models, and now the Surface Go. 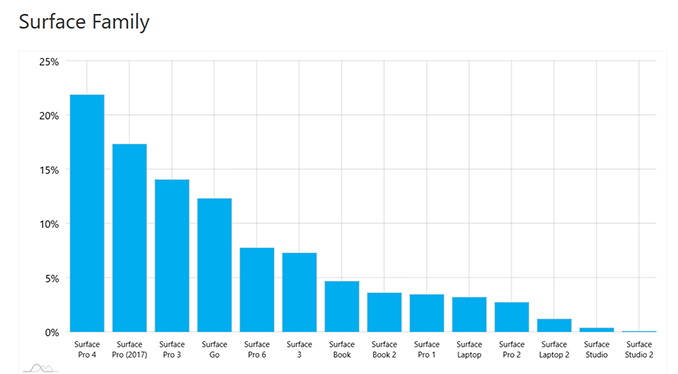 Looking at numbers from AdDuplex from December 2018, it makes it clear why the Surface Go was launched. And despite it only being on the market for about five months, it’s clearly gained a lot of traction in the Surface market, with usage share outstripping that of every other non-Pro model ever launched. We never got a chance to review the original Surface Go, but Microsoft has sent us the Surface Go LTE model for a full review. The Surface Go LTE offers the benefit of always-on connectivity – assuming you have cellular coverage of course – and this opens it up to an even wider audience of customers. Microsoft is clearly aiming the Surface Go LTE at business customers looking for a small device they can take on-site, with an even smaller footprint than the Surface Pro LTE, and a lighter form factor. As has been the case with the last couple of LTE variants for Surface, the Surface Go LTE utilizes a Qualcomm X16 modem. The rest of the Surface Go is unchanged. It’s still powered by the dual-core Intel Pentium 4415Y processor, and has the same 10-inch 1800x1200 3:2 PixelSense display. The only real difference is that the LTE variant is only available with 8 GB of RAM and 128 GB of SSD storage. The 4 GB / 64 GB eMMC model cannot be purchased with LTE. The Surface Go offers many of the same features as its larger siblings, including the Surface Connect port for charging and data. This is a big upgrade over the Surface 3, which only offered micro USB charging, and the Surface Go ships with a 24-Watt AC adapter. The advantage for business customers here is that the Surface Go will work with the same Surface Dock as the rest of the lineup, meaning it can easily be connected to power, displays, and Ethernet on the desk, and then with one magnetic connector, becomes instantly portable. The Surface Go also offers USB Type-C, which is a huge advantage for the Surface Go compared to the Surface Pro, since you can use any Type-C charger while on the road with the Surface Go. It does lose the USB Type-A port that is a key feature of the Surface Pro, but on a portable device like this, that is a worthwhile trade-off. If you need Type-A, you can of course get an adapter for Type-C, or use the Surface Dock. It's been quite remarkable to see just how popular this device is in the market, despite it only being available for a few months. Let’s dig into the Surface Go LTE. Reality of Windows on ARM is far from ideal. SD850 has shown to draw 8W on average on a 13.3" FHD IPS touchscreen, which is similar to 4.5W Core M (2C/4T) and only marginally more efficient than 15W Core U (4C/8T). Notebookcheck's numbers demonstrates Lenovo C630 (13" FHD, SD850, 60 Wh) measured 12 hours on a 60 Wh battery, while Dell XPS 13 9370 (13" FHD, i5-8250U, 52 Wh) with an even smaller battery recorded almost 11 hours with markedly better power consumption. Not counting factors like the fact that XPS has a far better screen, faster memory and storage all pointing to higher overall power consumption.